Don’t look Splitcoaststampers! This is my swap for Lyssa’s Convention Quality Swap. It’s the only organized swap I will be doing at Convention (and the best of course). I only hope that the Mint Macaron lace gets off the backorder list soon. I may have to use a different color on a few of the cards. I tried to use a bunch of new products: Brick Wall Embossing Folder, Mint Macaron Cardstock and Lace, Silver Metallic Thread and rats – I forgot the Perfect White Accent for the flower center. I’ll have to add that! 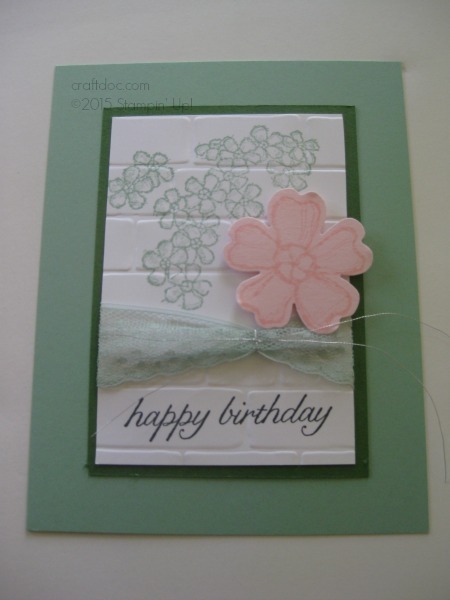 Stamp set is Birthday Blossoms. Other colors: Pink Pirouette and Garden Green. All products can be purchase at my website SHOP.